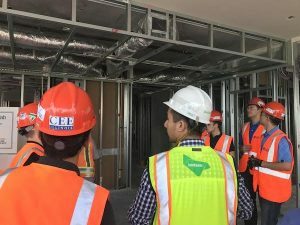 On Sunday, the University of Illinois Global Leaders in Construction Management hopped off the plane at LAX… Well, some of them did, while other students arrived via caravan. With a good night’s rest and a bit of sightseeing under our belts, we kicked off the week, Monday morning, with a Lendlease sight visit. We arrived at 6th and Flower Street to the Lendlease Office in Downtown Los Angeles at 10 AM to begin our visit. 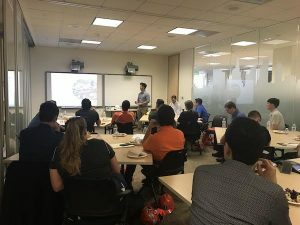 While there, a few employees kindly took time from their busy schedules to introduce us to Lendelase LA in terms of its culture and the different projects currently being managed. Project Manager, and University of Illinois Alum, Alex Chan, led our discussion along with the help of Fernando Llamas and Jim Gentile. 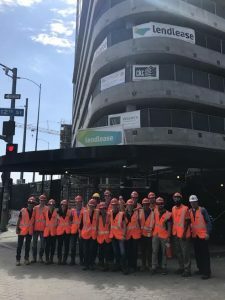 In the past two years, Lendlease LA has grown from an office of 30 people to an office of about 150 employees. 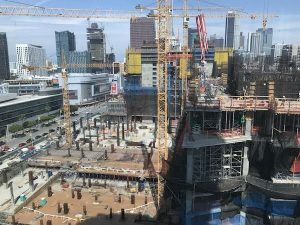 With that, the company has also won many high profile jobs in the downtown area; it will be exciting to see the contributions Lendlease will make to the changing Los Angeles skyline in years to come! Their different roles and levels of experience within the company provided us with well-rounded insight on the values and priorities of the company and their goals. After answering our many questions and eating a delicious lunch, we were ready to walk through the project site. Currently, Lendlease is working on two adjacent projects, referred to as Circa and Oceanwide. 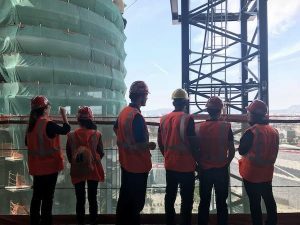 Together, the projects consist of over 2 million square feet of retail and residential space spread over 5 separate towers that are all over 30 stories high, with the tallest tower at 47 stories. We began by taking a service elevator to the 21st floor of one of the towers within the Circa project. From there, aside from the view of Los Angeles, we could overlook the Oceanwide project. The higher vantage point allowed us to see the workers below, as well as the cranes and concrete pumps at similar heights across the way. Because the project is estimated to be completed by January of 2018, the interior finishes have begun and are well under way. Along with Alex, a superintendent for the project walked through the site with us and was able to answer some of our more detailed questions. As we descended floors, we saw more and more finishes completed; the subcontractors begin working up from the ground floors, allowing us to see a sequential progression of the finishes. While the 21st floor still lacked ducts and installed walls, the floors below were almost finished. We ended in a room that lacked only furniture, which harbored one of the more interesting aspects of construction from the project. The Circa project has approximately 900 guest rooms; out of those rooms, 760 of them have pre-fabricated bathrooms. What this means is that the entire bathroom was constructed and assembled off site. This saves the owner money in the long run based on efficient time and resources, as the owner and architect can then make decisions earlier on in the construction process. By this point, we had reached the end of our site walk-through. Before sending us off on our next visit, however, we snagged a group photo with Alex and also another quick walk around the perimeter of the site. We were very pleased and impressed with how great our Monday morning began!